A few weeks back chicken fillets were cheap - very cheap - so I took advantage of both the sale and a healthy slush fund and stocked up. We really like chicken, but it can get boring very quickly if it's just the same old crumbed schnitzels meal after meal. This Baked Honey Chicken solves the problem. 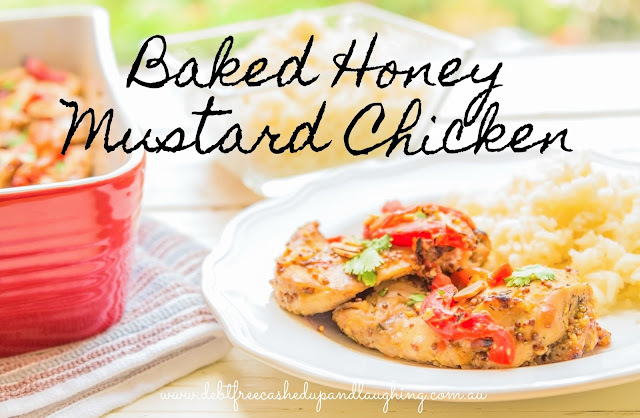 It is tasty, quick and a simple one pan dinner that uses just four basic pantry ingredients. Preheat oven to 175 degrees Celsius. Line a baking dish with foil. Whisk together the honey, mustard and basil in a small mixing bowl. Place the chicken fillets into the baking dish. Pour the sauce over the top to evenly cover the chicken. Bake 30 minutes or until the chicken juices run clear when the chicken is poked with a fork. Serve over steamed rice or steamed vegetables. *We prefer wholegrain mustard so I substitute it for Dijon. I buy the Aldi wholegrain mustard. **To make chicken fillets go further, I often dice them. Two large chicken breast fillets, diced, will give six serves - five for dinner and one for the freezer - for my family. If I don't have chicken fillets, I use drumsticks or maryland pieces. If it is too hot to use the oven, cook the chicken fillets on the barbecue - they're just as tasty and the kitchen won't heat up.